Christian motif in a traditional slide puzzle. Completes spiritual images or messages when puzzles are solved. Assorted. Poly bagged and sold by dozen. 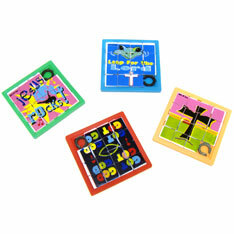 Perfect for Vacation Bible School or Sunday School prizes. $1.80 per dozen for 80 dozen or more. $1.55 per dozen for 160 dozen or more.